Graywolf Press takes up considerable space in my collection. I'm fine with that. They've produced good books by really talented writers. In addition to volumes by Elizabeth Alexander, Thomas Sayers Ellis, Harryette Mullen, Tracy K. Smith, and Natasha Trethewey, Graywolf has published scholarly work by Alexander and Kevin Young. I acquired the following Graywolf Press books over the years. Trethewey's Domestic Work, Smith's The Body's Question, and Jackson's Missing You, Metropolis were recipients of the Cave Canem Poetry Prize. Alexander's Praise Song for the Day was read at President Barack Obama's first inauguration. 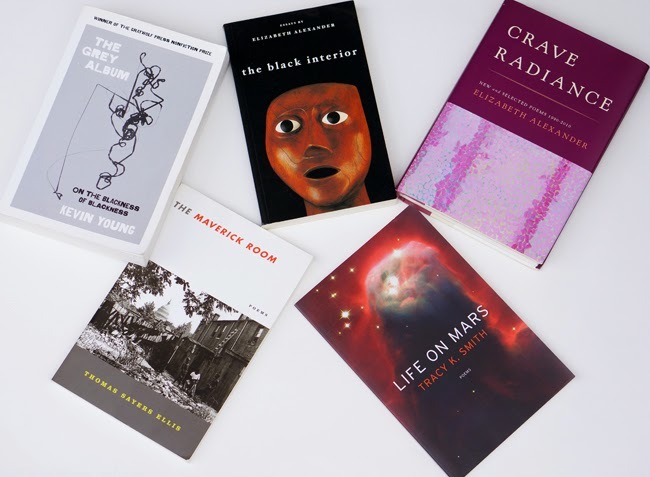 Smith's Life on Mars was awarded the Pulitzer Prize in Poetry, and Kevin Young's The Grey Album won the Graywolf Press Nonfiction Prize and was a finalist for the National Book Critics Circle Award for Criticism. I'll eventually purchase Graywolf Press books by Dexter L. Booth, Constance Quarterman Bridges, Carl Phillips, and Claudia Rankine. I also have to get Haryette Mullen's Urban Tumbleweed (2013).